Posted on July 25, 2017 by Billy S.
A matrix is a way to show information in columns and rows, like a table or a spreadsheet. Matrix items are specialty items from Formsite that allow form builders to collect a large number of answers in a smaller area by combining questions in the columns or rows. In addition to the various Matrix items, there are the specialty Multi-scale items and Star Rating item. These items have been designed to allow form builders to collect information in specific and unique ways. 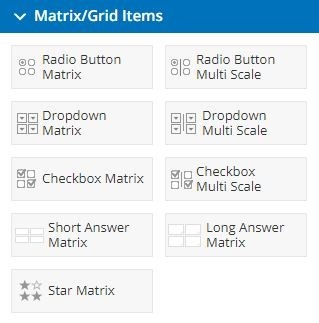 There is a matrix for each of the basic input items radio buttons, dropdown lists, and checkboxes, and the Short Answer and Long Answer items. These items let the form builder collect information across multiple columns and/or rows for those times when space is at a premium or when there are lots of possible answers. 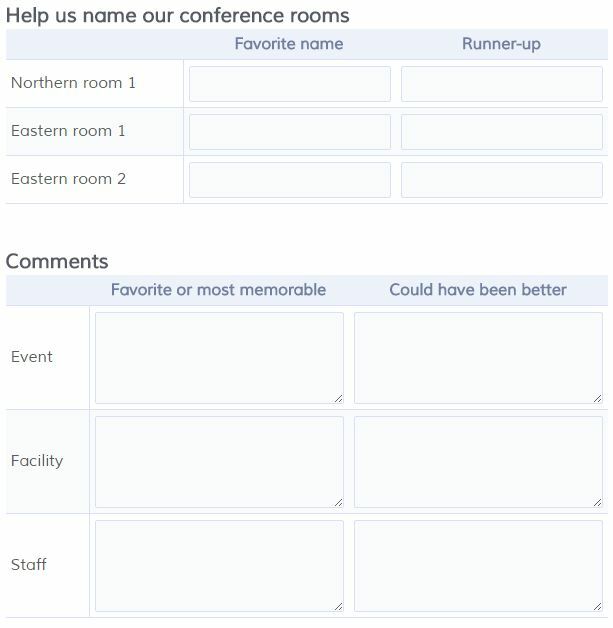 For example, this form asks different questions with the same answers. Since only one answer is accepted for each question, the Radio Button Matrix item is used. If there are long answers or too many to list in the form width, a Dropbox Matrix item can be used in place of the Radio Button Matrix. A similar item asks different questions with the same answers, but more than one is acceptable for each question so the Checkbox Matrix item is used. Short Answer Matrix and Long Answer Matrix items are used to collect typed responses instead of multiple choice answers. Multi-scale items are useful when there are answers in different groups. For example, the Radio Button Multi-scale allows for multiple answers across up to 4 categories. The Star Rating item is a familiar rating method of assigning stars to indicate a higher score. The number of stars is able to be set to allow for a larger scale. Styling the Matrix items is done through the Style page in the Form Editor, where the colors for the header rows and alternating rows can be set to suit the rest of the form colors. Exporting Matrix items in the Summary format provides questions as column headers and answers in the cells, while exporting using the Detail format provides answers as column headers with a ‘1’ in the cell. The first column width can be set in the Matrix item’s settings window to provide a consistent appearance for all matrices in the form. 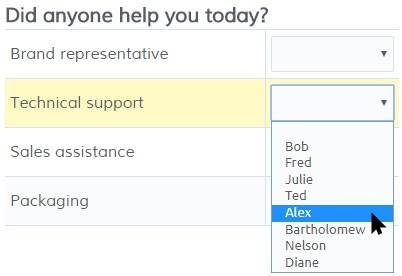 Matrix items are not able to be customized to display a mixture of item types, such as radio buttons with checkboxes. Only one type per item is allowed. Due to the complexity of Matrix and Multi-scale items, they are not able to be used with Calculations, Inventory, Workflow, or Conditional Logic for Notifications. Funneling is able to be used with Matrix items but not Multi-scale items.